Thank you all for your feedback on the short or longer videos :) I'm going to combine some suggestions from here and YouTube and film the longer videos but not include the minor details of cutting and scoring. I'll still mention the measurements of cuts and scores so you have them. and here are a few pictures of the finished card. Thanks everyone for stopping by today. I LOVE this card. It is my favorite so far. When you were punching random large hearts I didn't understand where you were going with it but when you stitched around it just came to life! Thanks for sharing your talents! Also, I like your compromise. I enjoy the longer videos better than the voice over but agree that we didn't need to see the cutting and trimming since we should all know how to do that! I always look forward to your videos! Thanks again! I absolutely LOVE this card! I have not been so much of a fan since you switched to only Stampin' Up! but this card is awesome. 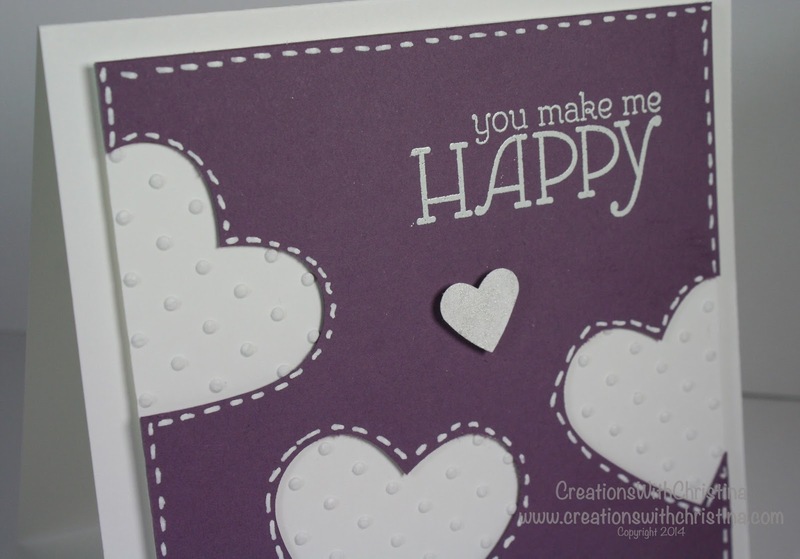 This has so many possibilities and doesn't look like a typical Stampin Up card.Thanks for sharing. I wasn't sure at first if I was going to like this card. Once you put the stitch lines on it, I was beginning to like it more....THEN, with the white dots behind, I was SOLD! This is definitely one on my MUST TRY list. P.S. The video length (and content) is perfect! Totally love how you cut out the hearts and then used that negative to be your layer on the card! This card turned out great and I love that purple!!! Gorgeous card! I enjoyed your blog so much better before it became all StampinUp. You do marvelous work with their supplies, but i love seeing all of the other manufacturer's supplies. I do check out your other blog too.